Bicycles in one form or another have been around for nearly 200 years. That’s plenty of time, you would have thought, for all the niggles and annoyances to have been ironed out of the road cycling experience. Of course, over the past two centuries there have been countless cycling innovations and inventions that we now take for granted. Many of them are the work of genius. Yet as technology marches on, new problems present themselves and we’re left wanting for things to be that little bit better. If we were to draw up a list of things we’d like to see invented to assist in our pleasure of cycling, these would be near the top. What would you add to the list? Look, Time and Shimano have led the way in giving us a way of attaching our feet to a bicycle’s pedals to provide an efficient way of transferring power from leg to wheels. However, we can’t help feeling that no manufacturer has got the mix perfectly right. It can take a fair amount of practice for the novice to get used to the mechanism of getting the shoe cleat into the pedal – and out of it (as the above video proves). There has been many a grazed knee, elbow or ego after an ‘SPD Moment’, where you tried to unclip your foot only to find yourself collapsing sideways into a immovable heap – usually in front of a large crowd of onlookers at a set of traffic lights. Double-sided mountain bike pedals and recessed cleats are better for everyday use than the road offerings, which make you walk along like a duck, slipping over on any surface that’s even the slightest bit damp. Skinny cyclists’ arms must differ wildly from the ones used by arm warmer manufacturers when they are designing their offerings. The dreaded Arm Warmer Slip can leave you with a band of bare flesh between the cuff of your short-sleeved shirt and the top of the warmers, which hang there saggy and wrinkled. Trying to yank arm warmers up as you ride along may result in you steering into a hedge. What we need is an arm warmer suspender, a device that keeps the arm warmers where they are supposed to be: actually on your arms. The pneumatic bicycle tyre was a fantastic invention, replacing the awful hoops of solid rubber than transferred every road bump into the cyclist’s arms and backside. The cushioning effect of an air-filled tyre has been a constant in bicycles for well over 100 years. However, if you fill something with air under pressure then sooner or later, somehow, it’s going to want to come out. 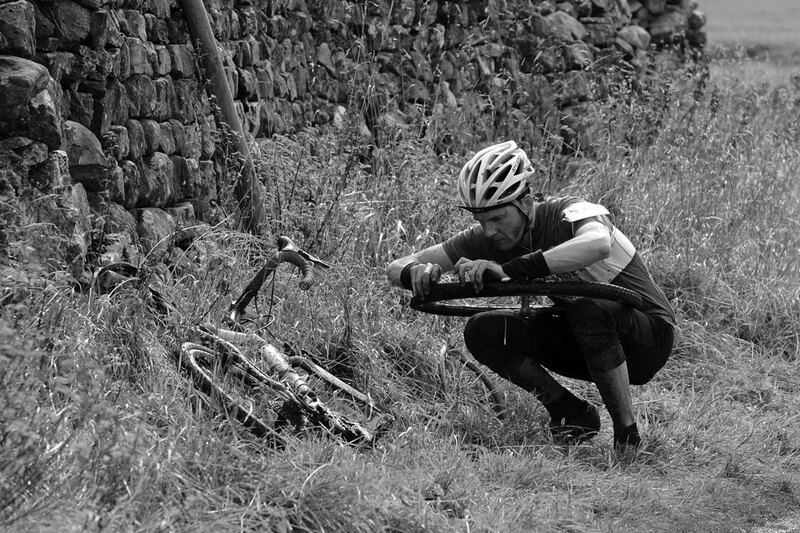 Punctures are the great ruiner of rides. Many have attempted to improve on the tyre-and-inner-tube set-up, including tubs, tubeless tyres, solid tyres and all manner of gloop to try and seal up punctures as you ride. All these alternative systems have some sort of compromise, and we’re still left wanting a tyre system that is truly puncture proof and doesn’t feel like you’re riding on a plastic hula hoop. 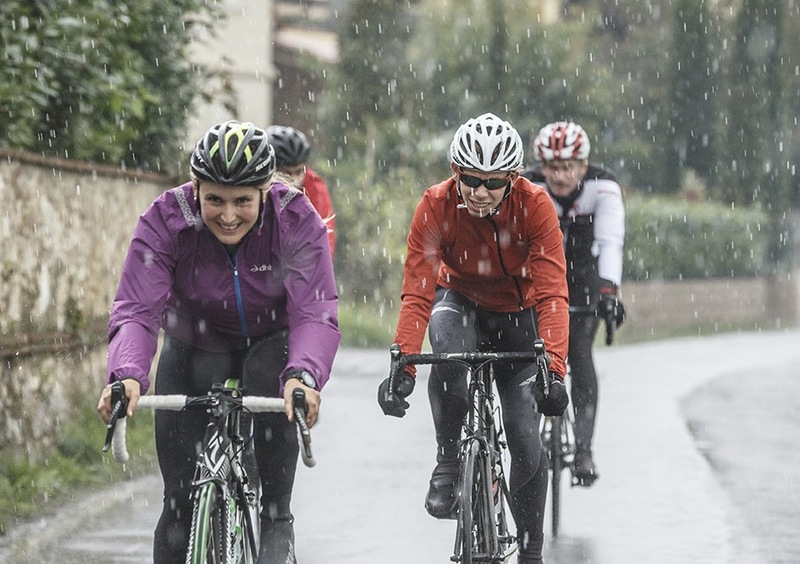 It’s true that great strides have been made into making comfortable, ‘breathable’ waterproof cycling garments that keep the rain water out but allow your sweat to escape, but we’ve yet to find one that is perfect. Most of us will have suffered from either perspiration dampness or boil-in-the-bag syndrome when wearing waterproof clothing on a ride. No amount of cleverly positioned vents can seem to prevent the build-up of perspiration under the jacket, some of which almost makes you as wet as if you hadn’t worn one at all. This one isn’t just about shirking our regular maintenance duties. Surely in our technological age there shouldn’t be the need to place the liquid remnants of fossilized plants on our chains to keep them moving. We’d like to see chains coated with a slippery, non-stick wonder material to keep them running smoothly, without the need to oil them and – even worse – degrease them. Degreasing a chain is the devil’s own work. While backpack-mounted ‘hydration systems’ have found favour with the mountain bike fraternity, roadies have largely stuck with the old waterbottle and frame-mounted cage system. Both have their advantages and drawbacks. Backpack drinks bladders are a pain to keep clean, and make your back sweat. Waterbottles are open to the elements and can get covered in muck. There has been more than one occasion when we’ve spotted a dob of dog poo on the top of a waterbottle… right after we’ve taken a hefty swig of plastic-tasting liquid out of it. We’ve had bar-mounted bottles with straws poking out of them, bottles mounted on saddles, and all sorts of other things, but none offers the perfect set-up. 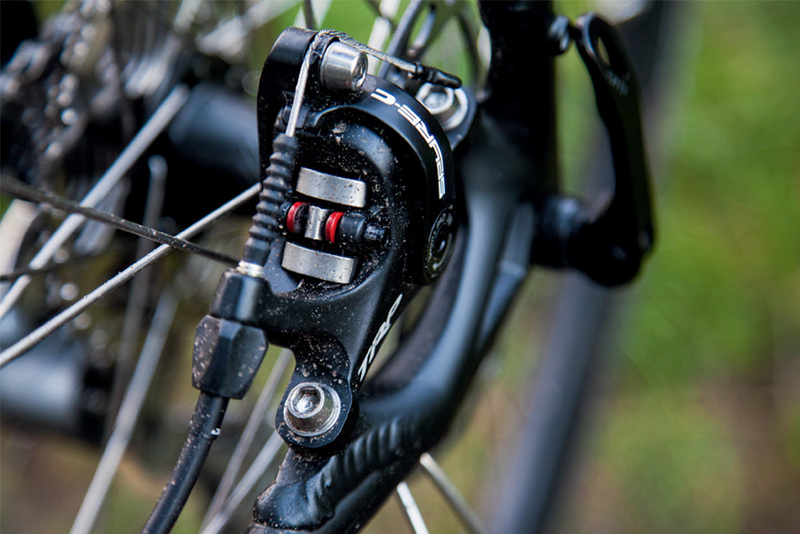 There’s a lot of talk about disc brakes on road bikes at the moment, and certainly the use of hydraulic disc brakes on mountain bikes has revolutionised stopping off-road. But on-road there are still compromises and problems, mostly related to weight, suitable mounts and consistent braking function. At least one major manufacturer has been forced to recall its road disc brake system due to a fault. Traditional rim brakes have probably hit their pinnacle in terms of design, and many work extremely well in the dry. But in wet conditions, with the rim’s braking surface running through water, stopping power is reduced severely. Road discs are undoubtedly the way forward – but not quite yet. Shining brightly at night can help, but what about during the day? 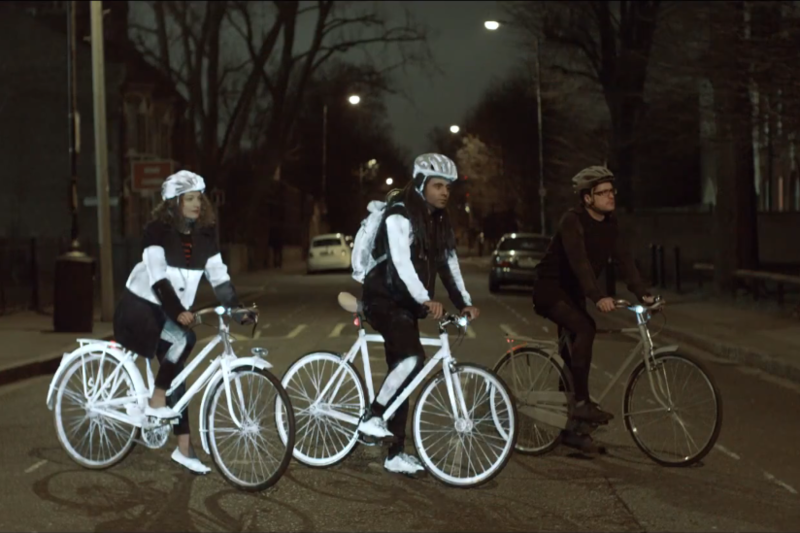 We’ve recently seen a large motor company giving away reflective spray paint to cyclists, that can be applied to any surface of the bike or rider to make them shine in the headlight of other road users at night. This is all very nice, but what happens during the day? Is there something that can give us the Ready Brek glow around the clock? And even if it did, would all road users really see us? Perhaps this particular ‘want’ on our list of bicycle inventions is one that applies more to other road users – and road designers – than the cyclists themselves. Segregated cycle lanes would be the most obvious solution, keeping bikes and other vehicles apart – but that isn’t always practical on an aging and space-limited road network. Last, but not least, can all cycle clothing manufacturers the world over please agree on what ‘medium’ actually means. Thanks.